Recorded Live at Cow Palace, San Francisco, CA, USA - November 20, 1973. Very Good- Audience Recording :: Bootleg Silver CD (RMST) :: CBR 320 kbps & FLAC. Files: 19. :: Size: 261.47 MB. Personnel: Roger Daltrey – lead vocals, harmonica :: Pete Townshend – guitar, vocals :: John Entwistle – bass guitar, vocals :: Keith Moon – drums. Notes: 2CD-remaster. 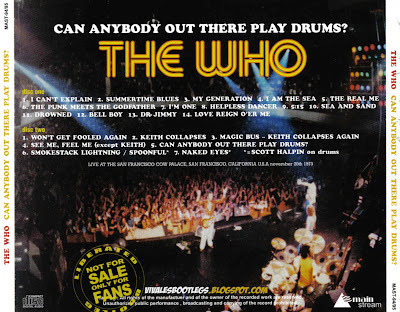 The Who's infamous '73 Cow Palace concert, their first in America in nearly two years. 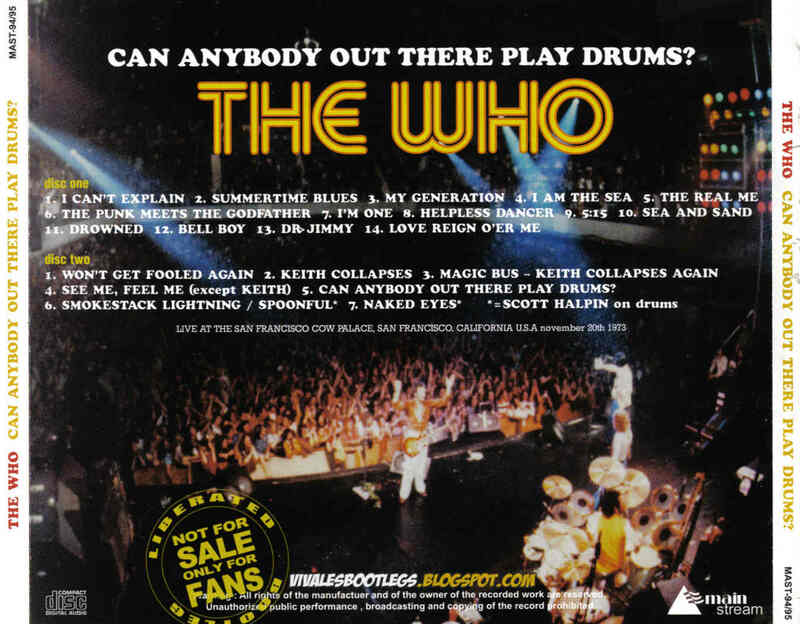 Despite its reputation as one of the worst gigs the Who ever did (K Moon passes out during WGFA! ), the first part of the show including Quadrophenia is quite good, at times exceptional. This version has been speed corrected and re-tracked from the silvers. <-(Info taken from original info file). An actually decent audience recording that is very much an upgrade from the older Our Drummer's Out Cold (CD) (Wholiday Music WH 008/9) which was a bad dub off the Bill Graham video. You can actually understand the stage announcements and hear the instruments. Decent soundstage and probably taken from close to a first generation recording. 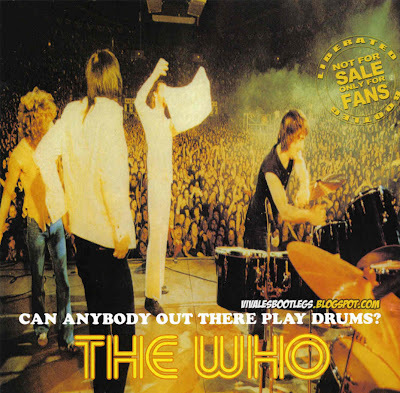 <-(Info taken from thewho.net). Lineage: Silver discs (*) > wav (EAC rip) > speed/pitch correction, re-tracked > flac. A big big thank you for this!!! !,cant wait to dl it!!! Top work. Heard lots about this show... can't wait to hear it at long last. Thank you for the share. Actually this show should be considered one of the best Who shows ever. It showcases the real Who.. hard partying and all.